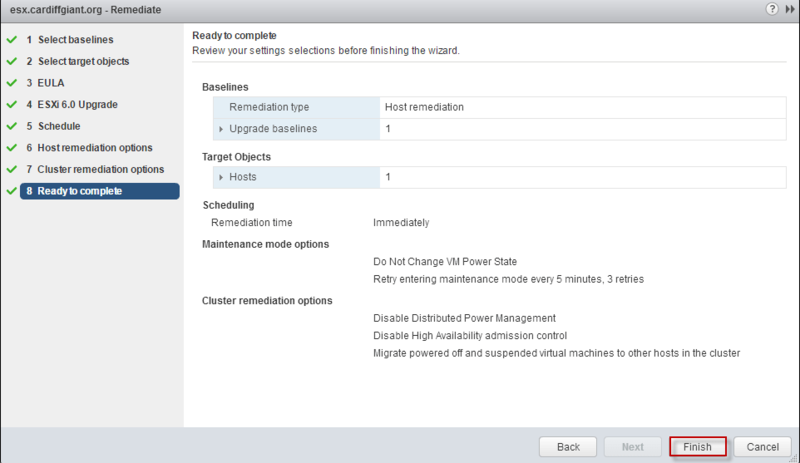 At this point in my home lab, I have got vCenter, Update Manager, and vSphere Replication all upgraded to vSphere 6. 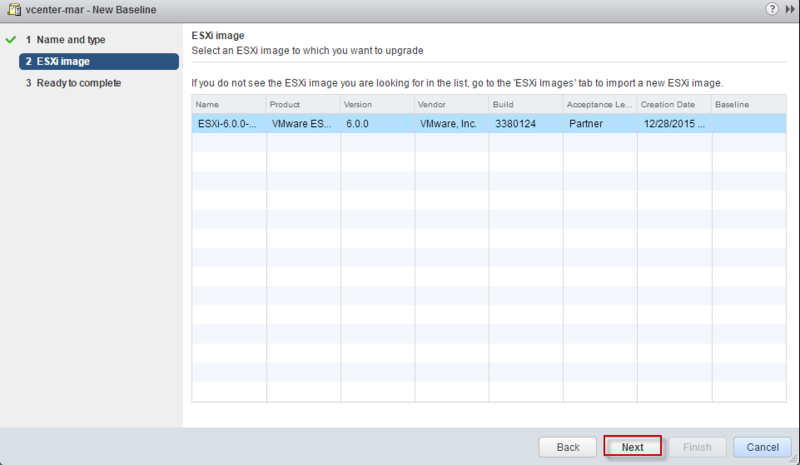 Finally, it’s time for the upgrade of ESXi! 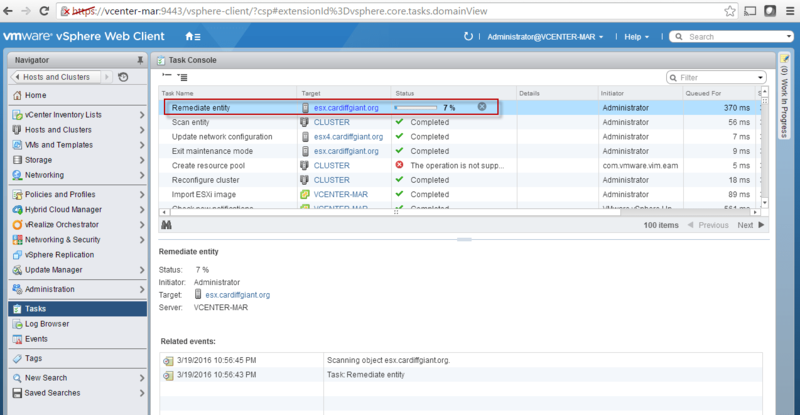 Having the hosts up to 6.0u1 is necessary for all of the really cool things that are part of vSphere 6, including vSAN 6.1 and the cross vCenter functionality of NSX 6.2. I am going to be upgrading a Dell R410 in this post, from ESXi 5.5u2 to ESXi 6.0 Express Patch 5. Unfortunately, Dell’s site does not supply an OEM rolled ISO of vSphere 6.0 for the 11th generation Dell hardware. Sadly, it looks like 5.5 will be the last supported VMware revision from Dell on the 11thgeneration server set. Of course, I am sure this would be an un-supported configuration from both Dell and VMware’s perspectives, but for my home lab this isn’t a concern for me. 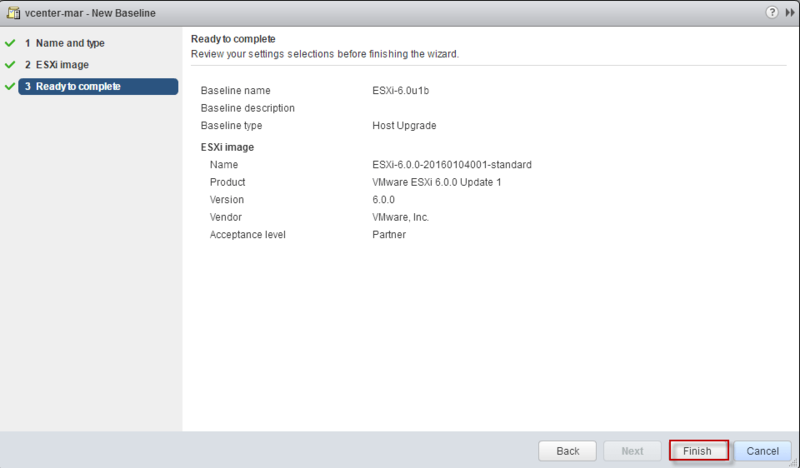 Log into my.vmware.com and pull the ISO down for 6.0u1b (latest release at time of this post). 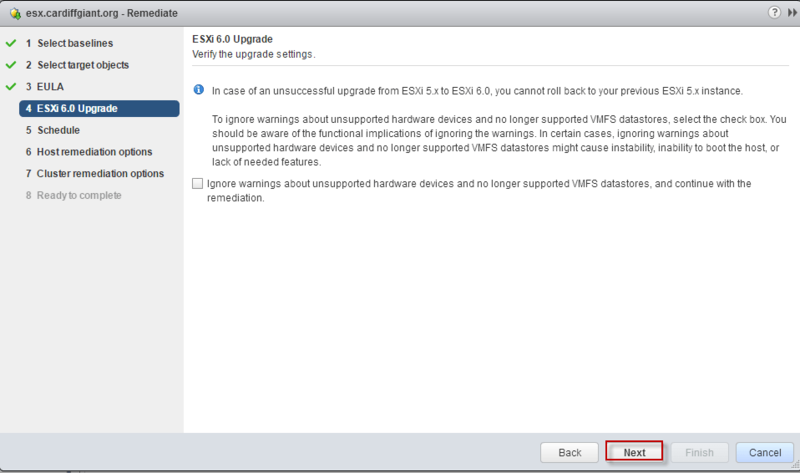 Place the download on a system that will be able to run the web client, so that we can upload the ISO into vSphere Update Manager and create a baseline for the host upgrade. 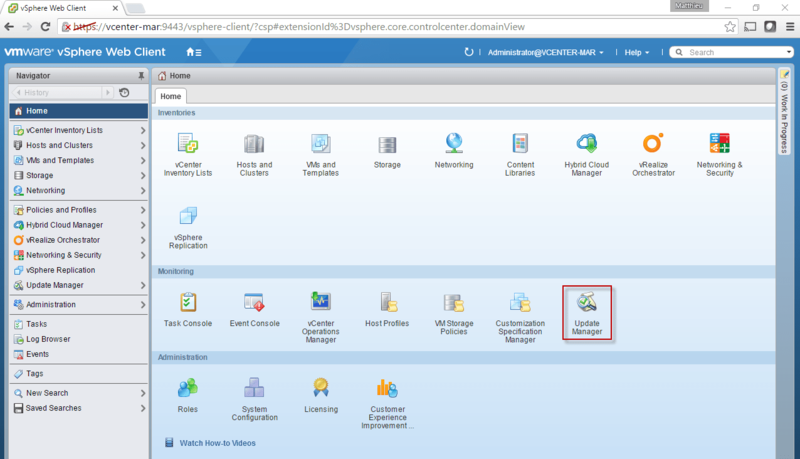 Update Manager Client has finally made its way into the Web Client in vSphere 6.0, so log in and navigate to Update Manager. 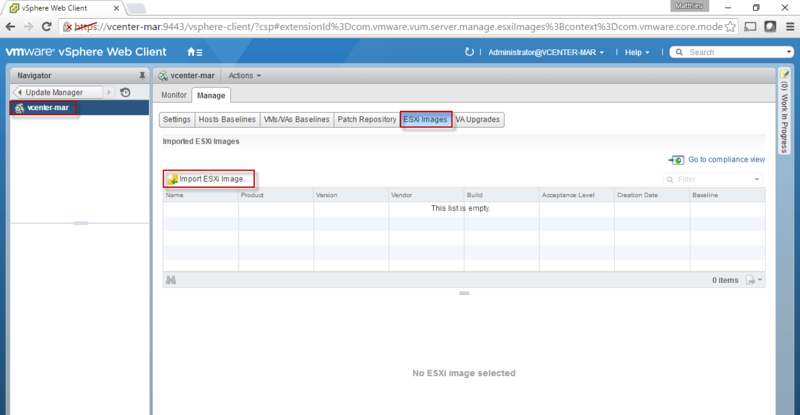 Browse to the ESXi ISO and import. Once the upload finishes, the image will be imported into VUM. VUM will verify the integrity and accept the import. Navigate to the “Hosts Baselines” tab, and add a new baseline. Enter a name for the baseline, and select type “Host Upgrade”. Select the imported baseline, and proceed. Complete the wizard to complete the baseline. 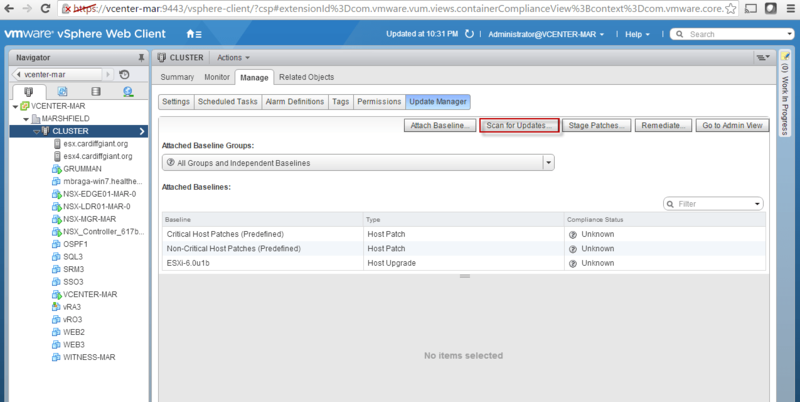 Select the cluster view and navigate to the Update Manager tab. Select “Attach Baseline”. 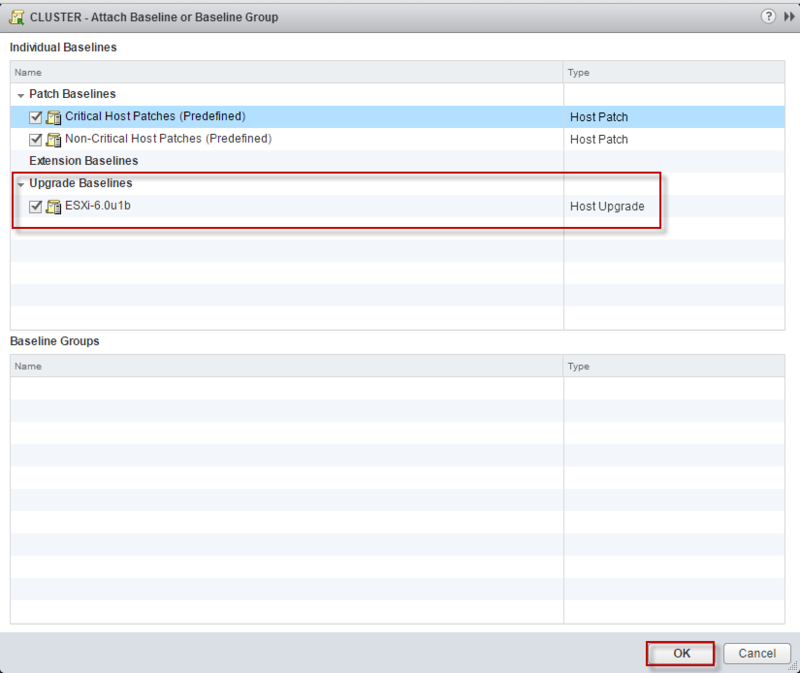 Attach the newly created upgrade baseline to the cluster. Scan the cluster to determine upgrade and patch requirements. 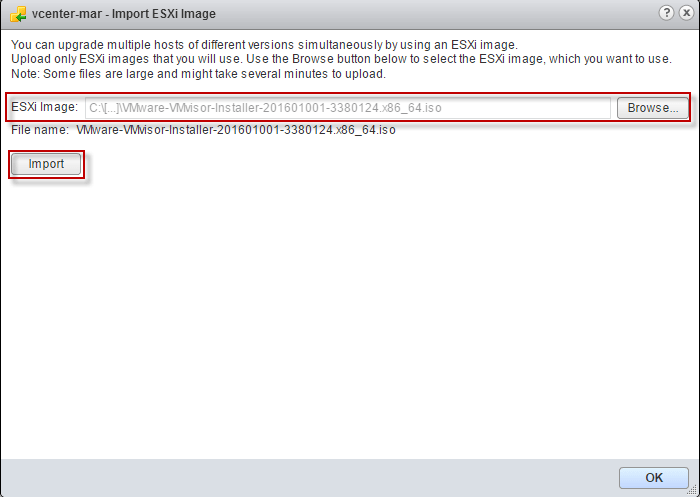 For this cluster, I have actually already upgraded my host “ESX4”, and is therefore showing as compliant. 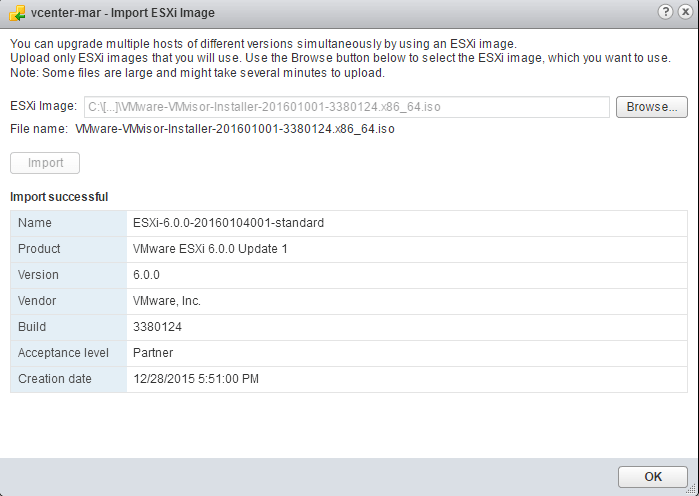 “ESX” remains at 5.5u2, and shows as non-compliant. 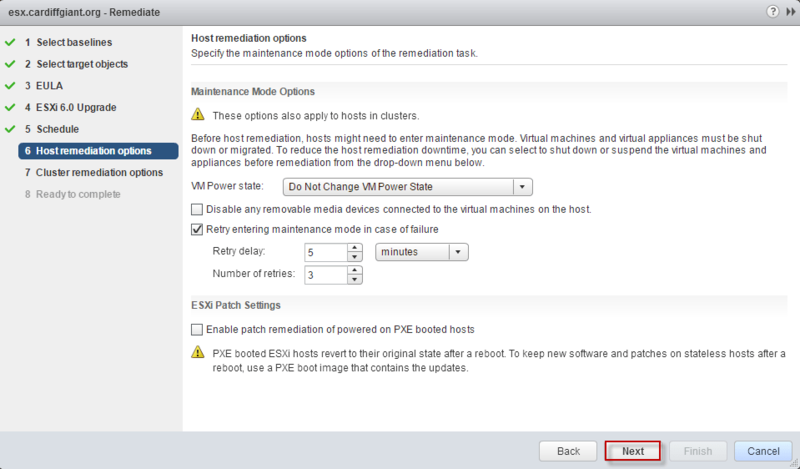 Let’s go ahead and remediate in order to get this host upgraded to 6.0u1b as well. 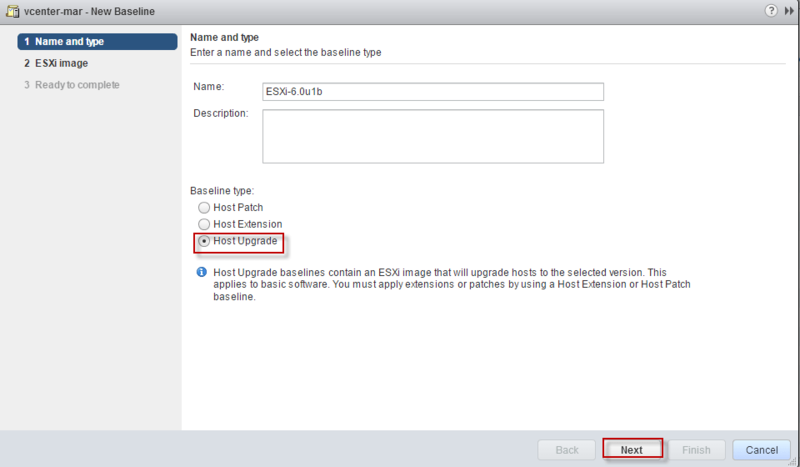 Ensure the host Upgrade Baseline is selected. 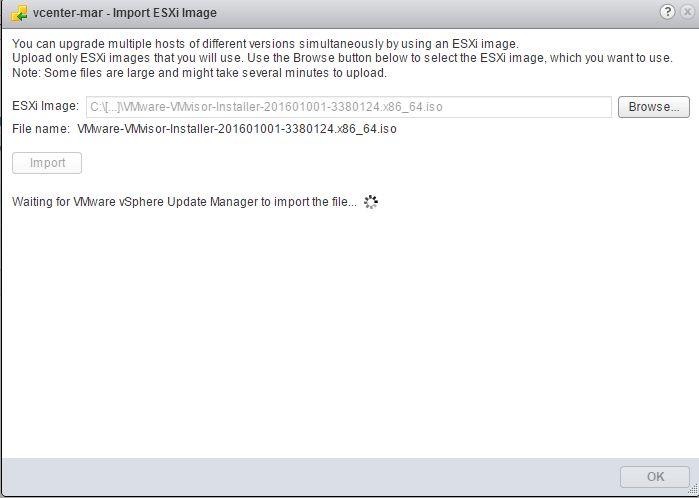 I already know I am using a non-Dell ISO for the vSphere 6.0 upgrade, and therefore want to definitely know of any issues the installer has with existing devices. I recommend leaving the “Ignore warnings” selection UN-selected. 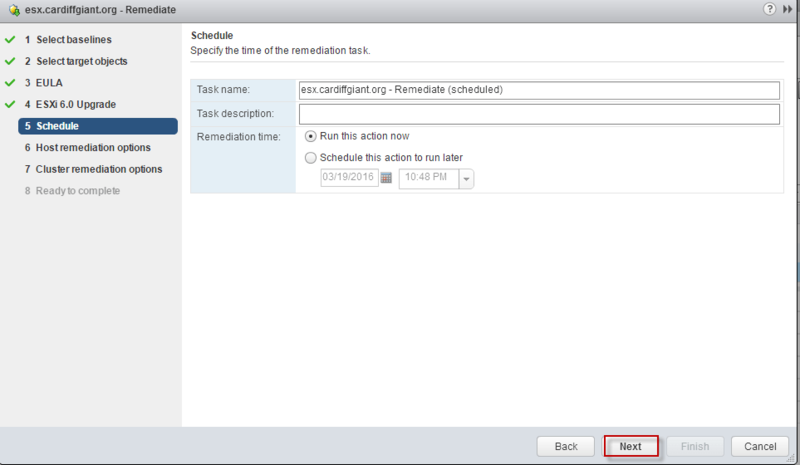 Select any host remediation options that may apply to your specific environment. Select any remediation offers that apply to your environment. 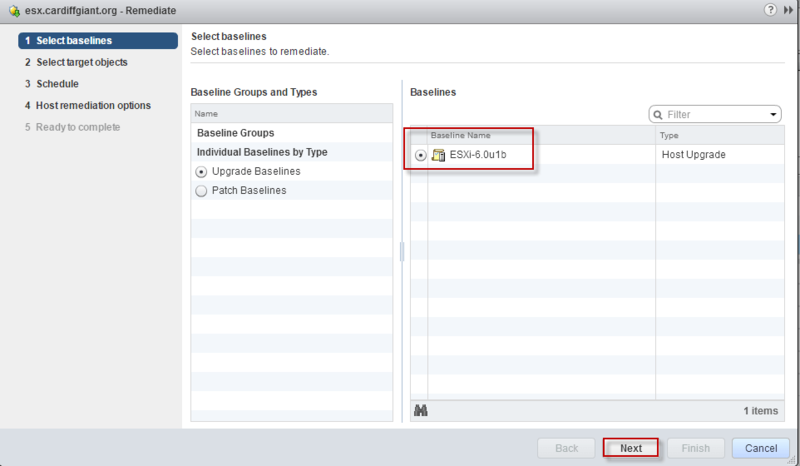 I usually add the selection for both disabling HA, as well as migrating powered off systems to other hosts. Finally accept the selections to complete the wizard and kick off the upgrade process! At this point, the host will enter maintenance mode and reboot as the upgrade and subsequent patches are applied. Progress can be monitored in the Tasks tab of the web client. The entire process for me against my Dell r410 took about 30 minutes across two reboots (one for the upgrade, a second for the patches). At the completion of the upgrade process, a quick check of the host software version actually shows us at build 3620759. Looks like the most recent set of patches that were included from the “Critical” and “Non-Critical” patch baselines are for 6.0u2. 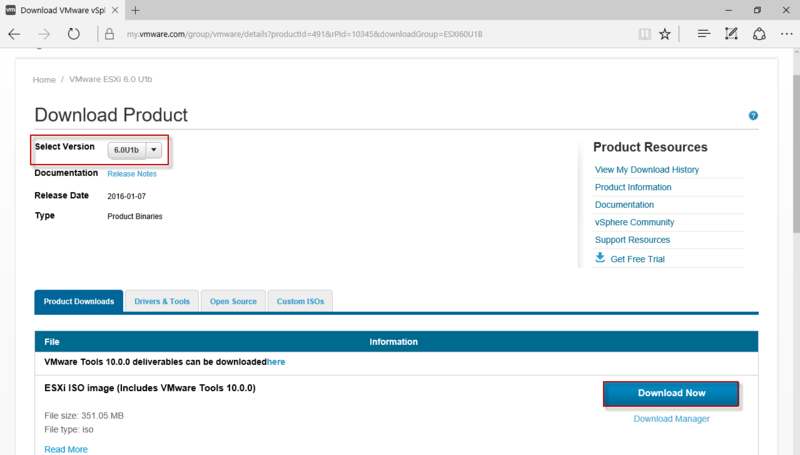 Sure enough, upon checking the VMware build release matrix athttps://kb.vmware.com/selfservice/microsites/search.do?language=en_US&cmd=displayKC&externalId=1014508, I see that 6.0u2 was released just a few days back. Awesome. Re-scan the host once more to ensure no additional patches on top of the 6.0u2 release are outstanding. Done! I have migrated machines back over to the upgraded host, and everything is working as expected. 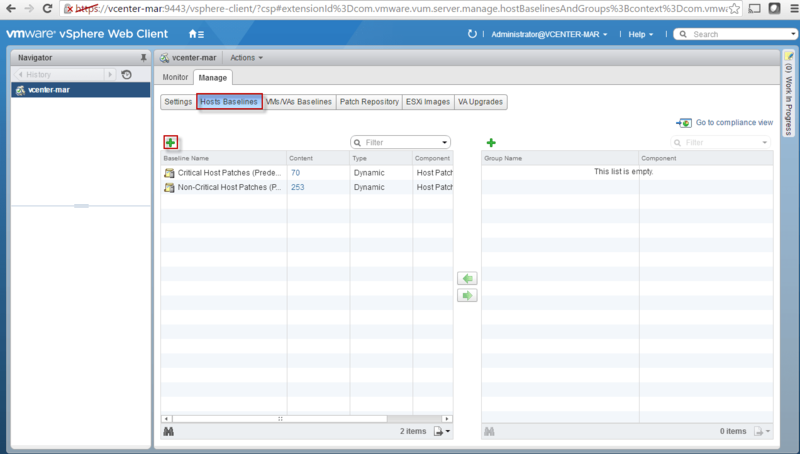 A quick check of the NSX host health shows everything is good post upgrade as well. 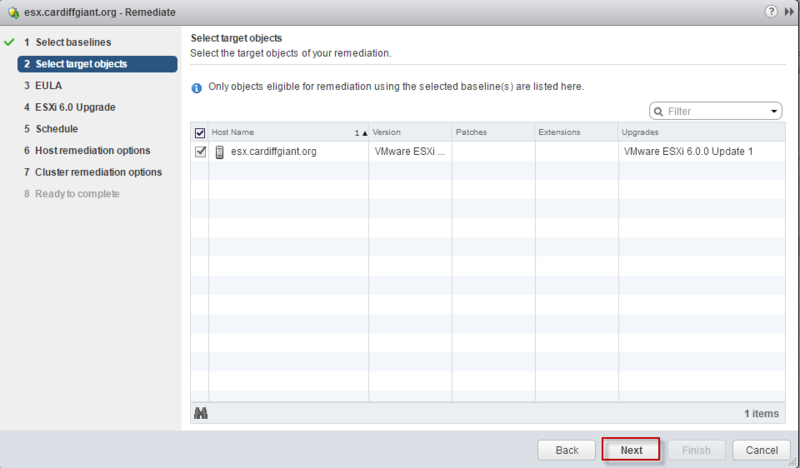 As a final step, you will need to apply new ESXi licenses to the upgraded hosts. 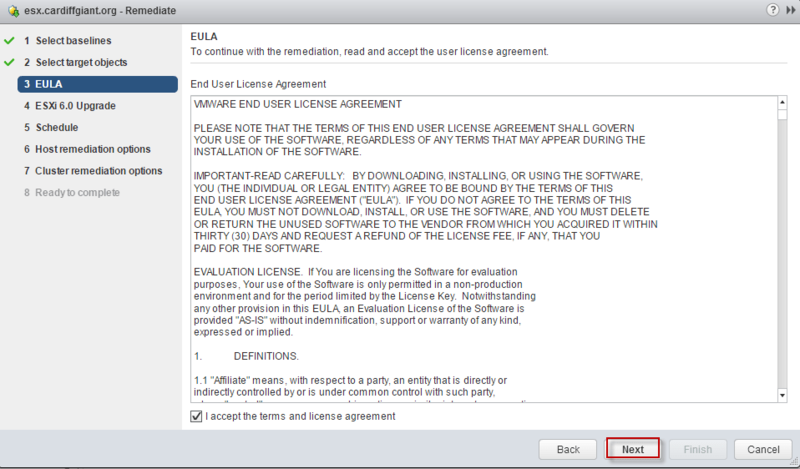 The upgraded 6.0 hosts will come with a fresh 60 day eval license, as the old 5.5 licenses no longer apply. 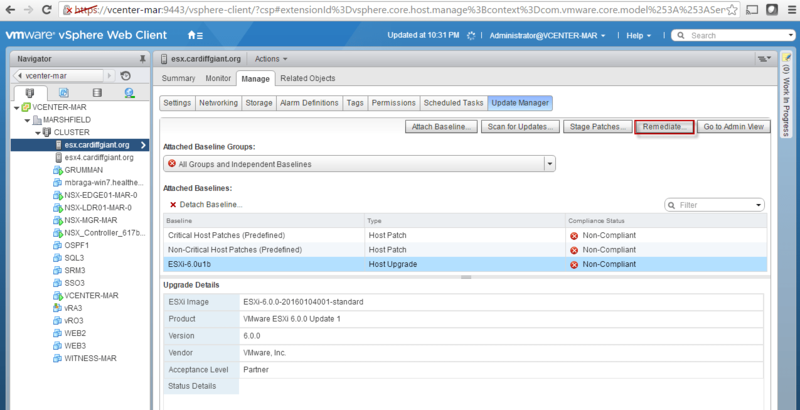 Log into the my.vmware.com licensing portal and upgrade the existing 5.5 licenses, and re-apply to the upgraded hosts before the 60 days is up. My lab is getting there. 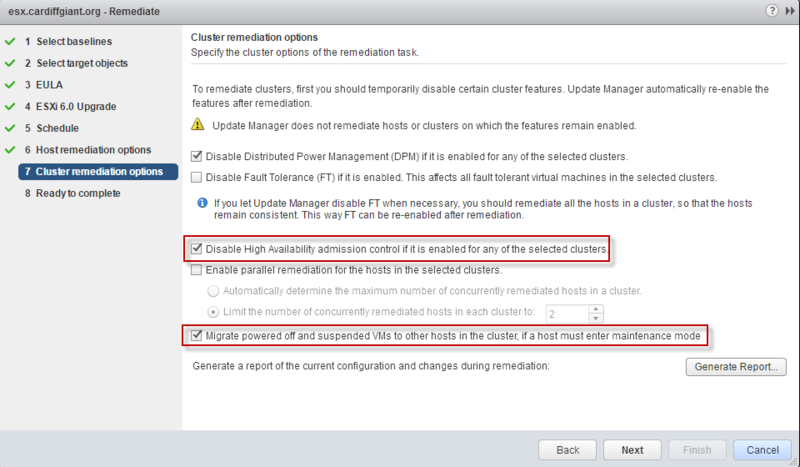 I was very excited to see that 6.0u2 was pulled down to this host during the upgrade in this blog – this means that the newest vSAN 6.2 features are going to be available to play with! Time to go back and upgrade the other hosts from 6.0u1b to 6.0u2, and also look at getting vCenter up to the latest 6.0 release as well.